It’s been almost 32 years, but Doris Thomas still remembers exactly what she was doing at 2:40 a.m. April 27, 1987. She’ll never forget that moment. She had just been woken up by the ringing of her phone. It was the call she had been waiting for. She was about to become the first person to have a heart transplant performed at OSF HealthCare Saint Francis Medical Center. Doris, of Marseilles, was 55 years old at the time. She was suffering from congestive heart failure and had been on the heart transplant list since February. When she got the call that there was a heart waiting for her, her family took her immediately to Peoria for surgery. At the time of the surgery, she was told she could expect to live another 10 years, but she blew past that timeline long ago. A lot of life has happened in the 32 years between the heart transplant and today, and Doris is grateful for the gift that gave her more time with her family. 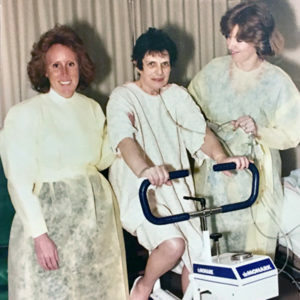 Carol Linett and Carol Koch assist Doris Thomas with cardiac rehabilitation following her heart transplant in 1987. OSF Saint Francis was home to a heart transplant program that began with Doris’ case in 1987 and ended in 2006 due to decreasing patient volume and physician retirements. Over its 19-year run, the program successfully completed 197 heart transplants. Now, the program is making a comeback. In January, the Illinois Health Facilities and Services Review Board approved the hospital’s certificate of need application to re-establish the heart transplant program, which OSF HealthCare leadership said could take up to 18 months to complete. As the first person to ever receive a transplanted heart at OSF Saint Francis, Doris stands as a testament to the powerful impact of organ transplantation and the importance of re-establishing the OSF Saint Francis program. With heart failure cases expected to rise in coming decades, OSF Saint Francis will offer the only heart transplant program in central and downstate Illinois. It will be a destination center for both transplants and ventricular assist device procedures (VAD), offering patients in the area a second chance to celebrate the gift of life. Doris said she is glad the program is coming back. The heart transplant give her more than 30 years she wouldn’t have had otherwise to spend with family, and she fondly recalls the people who cared for her during the seven weeks she spent recovering at the hospital.